Deadline is 6PM eastern standard time on the 24th. If anybody has questions, ask them. 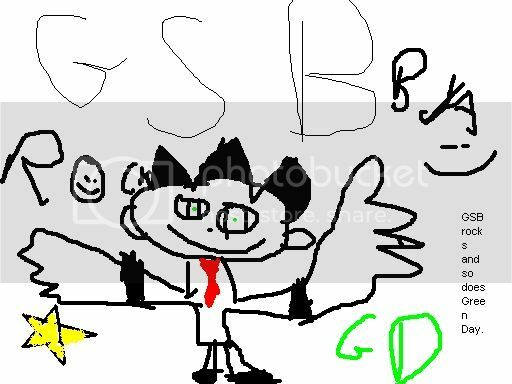 I did a work on paint that features Billie and a unique GSB design. Not that I'm gonna actually try. That's a very good question. How about 6PM eastern standard time on the 24th. Then either GSBians can vote or the mods can pick a winner, and hopefully we can get the album to the winner on it's release date. Unless nobody cares about the release date then we can extend the contest. I'm just making it up as I go. You guys can tell me what you think we should do. This is a super short poorly planned last minute contest. But if this goes well maybe we can do more. Ok. I don't care. I mean unfortunately I'm busy all weekend but we can do whatever anyone else wants. awww i missed the deadline! a winner and everything has been picked at this point though, yes? Shannon won. I forgot to tell everybody else though. Hey everyone. What do you think of my Green Day picture? press "vote" to the right if you like it. you can vote through facebook annnnnd twitter. It would meen the world to me!